Registration Deadline: Wednesday, June 15, 2016 or when submission limit is met. PONSHOP is pleased to announce our seventh community art exhibition in July of 2016, and we invite you to participate as an artist in the event! “Model Kit Marvels” will feature custom-painted model kits supplied by the New York-based company Boundless Brooklyn. Artists can select between the Boundless Brooklyn Half Pipe, Medium Water Tower, or Billboard kit. Entry Parameters: Artists can modify their model kit however they see fit, adorning with paint, markers, and incorporating additional materials. The models, however, must retain the same "footprint" - meaning that no materials shall excessively extend beyond the volume of the model. 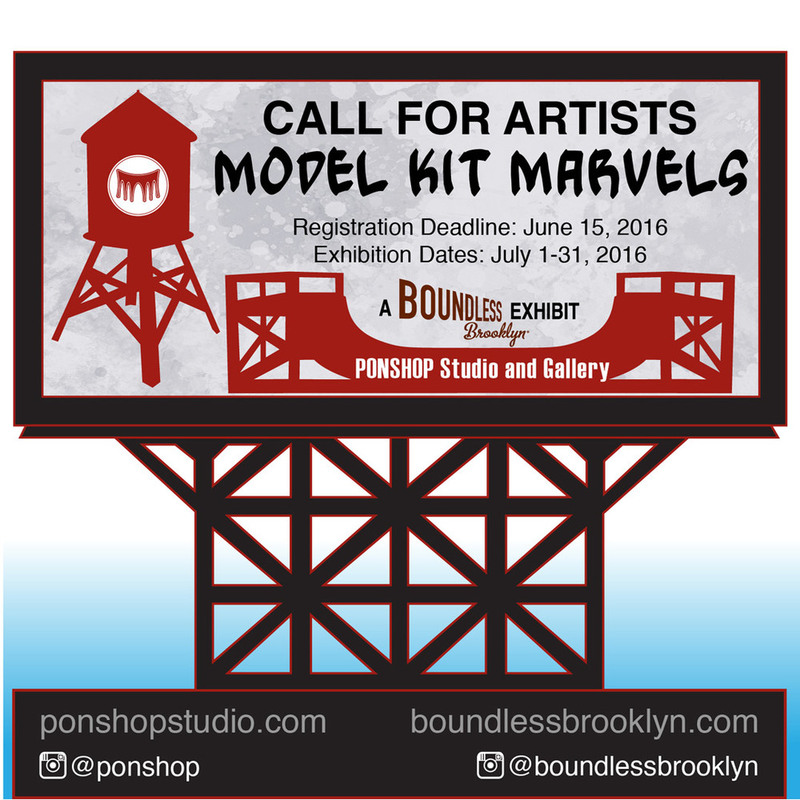 Boundless Brooklyn Kits must be purchased through PONSHOP. All artwork must be assembled and dry upon delivery and all work must be for sale (The gallery retains 40% commission on all sales). The gallery reserves the right to reject entries based upon quality: uniqueness and creativity, craftsmanship and execution. Late Entries will be rejected. Entries must be original creations of the artist - no reproductions of others artwork. We encourage all participating artists to join us for the opening reception. We'll be doing a Do-It-Yourself Model Kit workshop in our classroom and, weather permitting, we'll have our garden open as well for guests. PONSHOP is a multifaceted storefront: an art gallery, retail store, and classroom. The vision of the owners, Scarlett and Gabriel Pons, is to provide a place that embodies what they love: art, design, and creative education. The gallery features a variety of work from artists both near and far. Their storefront includes a classroom, providing workshops for students interested in everything from painting, ceramics, and architecture to street art and skateboarding. PONSHOP has been retailing Boundless Brooklyn products since 2015 and incorporates Boundless kits in their art curriculum, teaching students about the history and architectural importance of these miniature structures.